thanks for the post, nice and weird! Can you point me to lowbrow vol 2? I can't seem to find it. All of this looks like fun! Regarding the "uncredited" music bits -- many times, low-budget film makers just used "stock" or "library" music, rather than commissioning new work. FUN FACT: "One of his [Fred Katz's] most recognizable pieces of music was his score for the 1959 film A Bucket of Blood, directed by Roger Corman, as the music appeared in a total of seven Corman films, including The Wasp Woman (1959) and Creature from the Haunted Sea (1961). According to Mark Thomas McGee, author of Roger Corman: The Best of the Cheap Acts, each time Katz was called upon to write music for Corman, Katz sold the same score as if it were new music. Katz explained that his music for Corman's The Little Shop of Horrors was created by a music editor piecing together selections from other soundtracks that he had produced for Corman." Freddie, that is funny. I read Corman's memoirs and dont remember that. Perhaps he wasnt aware Katz was doing that..or didnt care. Figured: everyone will be focused on the monster, who's gonna notice the music? But some of the uncredited music here, I think the track I call "spooky bongoes," has what sounds like a crazy teenage rock n roll band doing a Bo Diddley jam. Unlikely that that's production library music. Cat A. Waller may be reluctant to ID the contents publicly, but readers can rest assured that each tune is labeled with full title/artist info, and each volume includes "front cover" artwork. Great compilation, but track 32 seems to be defective. Raumpatrouille! That reminds me - I've got a great collection of Raumpatrouille's composer Peter Thomas. Been meaning to post it. Just played tr 32 and it worked fine for me. But you're not missing much, just a few seconds of Heston informing us that (spoiler alert!) Soylent Green is people. Which I'm sure you knew anyway. Yay! Just in time for my Halloween party. It'll drive everyone crazy! 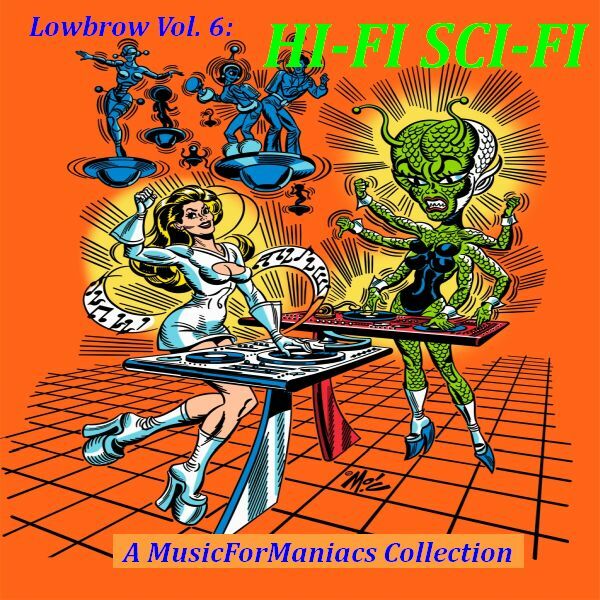 Click up where it says: "Lowbrow vol. 6: Hi-Fi Sci-Fi."